The next live episode of City Connection will air live on GRTV's Livewire 24 and right here on The Rapidian at 5:00pm on January 3rd, 2011. We will announce it again. Watch episodes from the last two seasons here. *** UPDATE *** The above video is a recording of tonight's City Connection. From The Rapidian Staff: Ever wonder how cities prioritize street construction after the winter? Or about the city’s commitment to sustainable practices? What’s up with that new landlord waste removal ordinance? And what the heck even are My GR City Points anyway? If you’re brimming with questions or wondering what other Grand Rapidians are thinking about, tonight’s your chance. Mayor George Heartwell will be taking the screen both on television and on the Internet. In fact, right here. Right on this very page at 5 p.m. this evening. 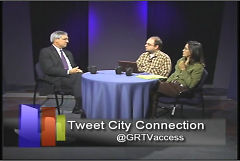 For 18 years, the mayors of Grand Rapids have hosted City Connection, a monthly, live call-in show on GRTV’s Livewire, Comcast channel 24. * Mayor John Logie started the program in 1992 as a way to share mayoral perspective with Grand Rapidians and to bring a little more transparency to local government. City Connection is an opportunity to interact directly with one of our city’s top elected officials. City Connection has experienced a few changes over the years. Hosting duties were passed along to current Mayor Heartwell when he was sworn in as Grand Rapids newest mayor on Jan. 1, 2004. 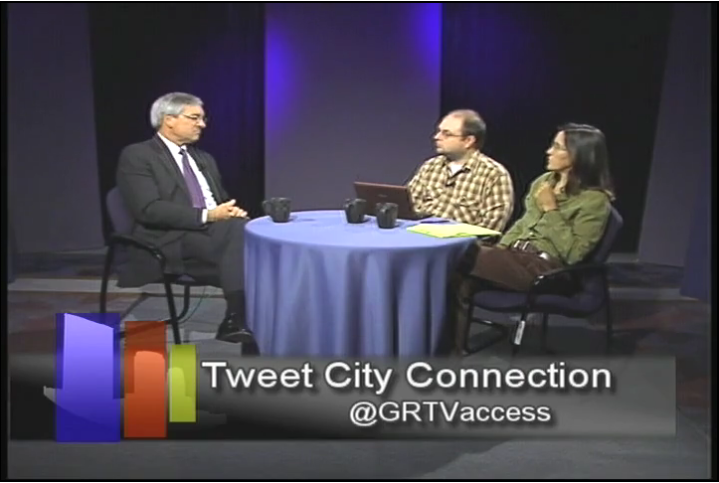 City Connection has been streamed on the Internet since March, and interested Grand Rapidians can email ([email protected]), tweet @GRTVaccess, or Facebook comment in their question to the mayor. While normally co-hosted by GRTV’s Outreach Coordinator Barbara Hansen O.P., Linda Gellasch and Tom Schwallie of Grand Rapids Community Media Center have been guest hosting while Sister Barbara is on a brief hiatus. And as of today, the program will now be streamed live on The Rapidian on the first Monday of every month. If you have any burning questions for the mayor ask in the comments below, and come back tonight to watch him respond live on the air. 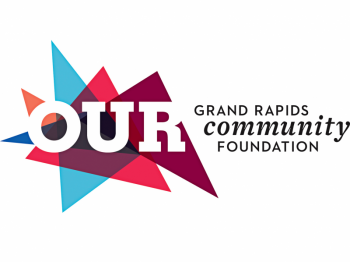 Disclosure: *GRTV, like The Rapidian, is a proud service of the Grand Rapids Community Media Center. I have a lazy friend who doesn't like to return his bottles and cans. If he were to put them in his recycling bin, could the city "keep the change?" How are things sorted with the new one bin recycling service? I live on a small street in Heritage Hill with only 2 driveways and odd/even parking during the winter months. It seems our street is often disregarded by the plows, even when one side is clear (which proves to be a difficult task in the evenings). Our street is constantly ticketed, mostly because people give up or have no where else to park because the snow piles up so bad. Is there a schedule of snow plow routes? I've always assumed the way to communicate with my community safety officer is to go through the community organizer from my neighborhood association because they are privy to more information that needs to be filtered before it gets to me as a resident. Are community organizers the official channel? What sort of information are community safety officers not allowed to divulge to residents but can share with community organizers? Can you (Mayor Heartwell) please speak to the rumors of privitization of the cities water and sewer systems? Why are we as a city (when we tout ourselves to be ecologically conscious and sustainable) looking towards priviate compaines such as Suez and Thames corporations who have created such struggles for water in impoverished countries? Shouldn't we be first looking at budget cuts rather than quick fixes? Wouldn't the city run better if the Mayor was a full time position? Your question was a little too late to make it into last night's episode of City Connection. It's a great question and I will do what I can to ensure it is asked in the January 3rd taping of the next episode. Tune back in then! Thanks to everyone else who asked Mayor Heartwell a question, Watch the video above to see his answers.